To Use it as a Golf Ball, You'd Need to Stand 1.2 Miles Tall! On October 1st, 1979 ground broke for the second Theme Park at Walt Disney World. It was constructed $1.4 billion and took three years to build (at the time the largest construction project on Earth), covering an area of 300 acres - more than twice the size of the Magic Kingdom (be prepared to walk)! The parking lot serving the park is 141 acres (including bus area) and can accommodate 11,211 vehicles (grass areas hold additional 500+ vehicles). 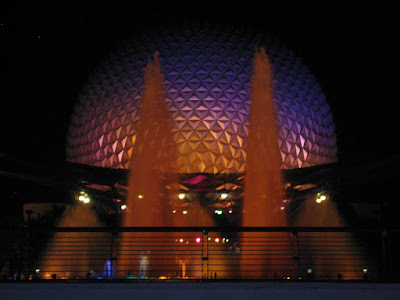 On October 1st, 1982, Epcot was opened. Unless you're me, you really won't be able to see it all in one day, so if that's all the time you have, plan carefully. 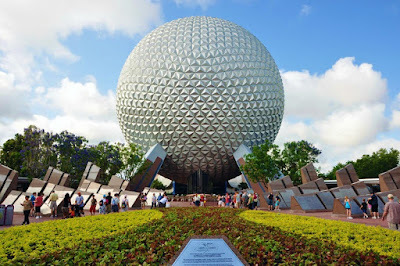 EPCOT is an acronym for Experimental Prototype Community of Tomorrow, which was the name originally given by Walt Disney to a conceptual Utopian city of the future that he had wanted to build on the site that is now Walt Disney World. Disney's original vision of EPCOT was for a model community, home to twenty thousand residents, which would be a test bed for city planning and organization. Disney's vision was not realized...unfortunately he passed away before it could be built, and the Walt Disney Company decided that it did not want to be in the business of running a city. 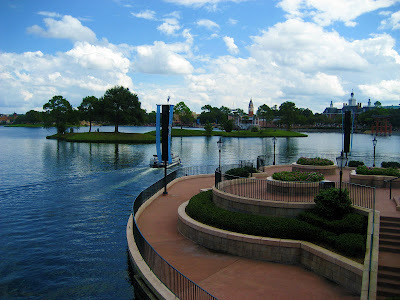 The park is dedicated to the celebration of human achievement, namely international culture and technological innovation, designed to both entertain and educate, and consists of two sections laid out in an hourglass shape: Future World, where you can experience the past and future of technology advancements, and World Showcase (surrounding a lagoon), which highlights the architecture and culture of 11 countries. 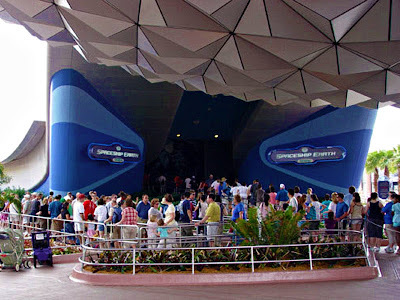 Both sections are patterned after the types of exhibits found at world expositions, in fact in its early years, Epcot was often called a "permanent World's Fair." 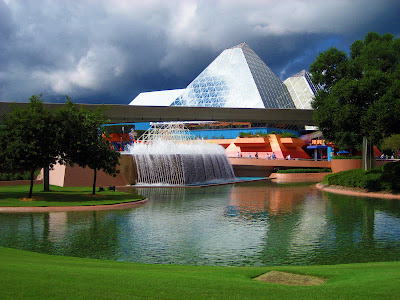 In 2010, Epcot hosted approximately 10.83 million guests, ranking it the third most visited theme park in the United States, and fifth most visited theme park in the world. I paid the price-gouging parking fee of $14 and arrived at the 9,000-space parking at 9am, right as the park opened. Planning on being a complete and utter glutton, I walked instead of hopping the tram that take you to the main entrance, had my admission pass scanned at the entrance turnstiles, grabbed a park map, and there I was in Future World, standing right in front of the park's giant geodesic, spherical icon and attraction, Spaceship Earth - conceptualized and designed with the help of science fiction author and Disney fan Ray Bradbury. I stepped inside, and into a slow-moving omnimover "time machine" vehicle (equipped with interactive touch screens, image capturing and face recognition technology), which, over a dramatic 63-piece orchestral and 24-vocal musical score (composed by Emmy Award winner composer Bruce Broughton), and the narration of Academy Award winner Dame Judi Dench, transported me on a 16-minute inspiring journey through 40,000 years - from the dawn of recorded time to modern day, with audio-animatronic scenes depicting the stirring story of human connection, such as prehistoric man, ancient Egypt, the Roman Empire, and the Industrial Revolution, before catching a glimpse of my potential self living in the future. 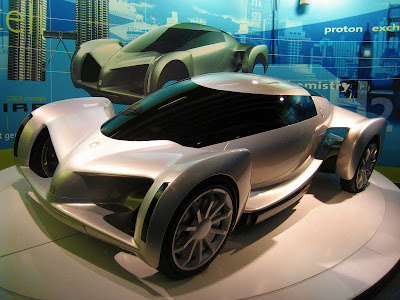 Upon exiting the ride, I entered an exhibit space called "Project Tomorrow: Inventing the World of Tomorrow," which allows guests to see the future of medicine, transportation and energy management, through interactive displays, games and activities, such as Body Builder, a 3-D game to build a digital human body, and Super Driver, a driving simulation video game featuring vehicle accident and avoidance systems, simulating the future of driving. Next I became a crash test dummy braving unpredictable terrain in a futuristic "test vehicle"on Test Track, an indoor/outdoor high-octane thrill ride in a "GM testing facility," taking riders through an unpredictable series of assessments that illustrates how automobile prototype evaluations are conducted. 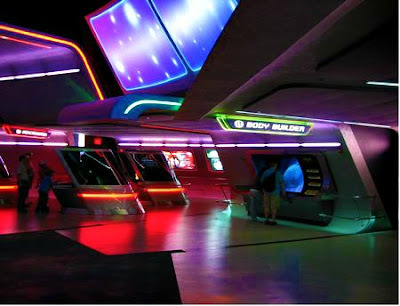 The highlight is a speed trial on a track around the exterior of the building at a top speed of 65 miles per hour on a 50-degree banked curve, making it one of the fastest Disney theme park attractions ever built! AWESOME! 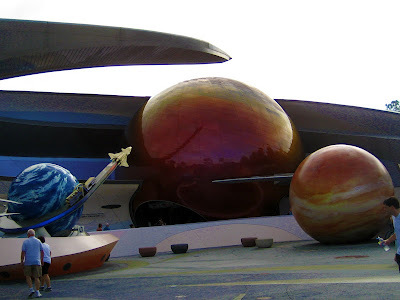 I traveled 8,000 in 5 1/2 minutes on Mission: SPACE, a motion simulated thrill ride that turns you into an astronaut in training on a realistic space flight to Mars—dodging meteors as you attend to your aeronautical duties; available in 2 versions: the Orange Team for the original, more intense training session where you will experience forces up to 2.4G (more than twice the force of the Earth's gravitational pull) or opt for the Green Team for a less intense experience. Before boarding the simulators (four separate centrifuges, each with 10 capsules holding four riders), each rider is assigned an on-board role (navigator [mine! 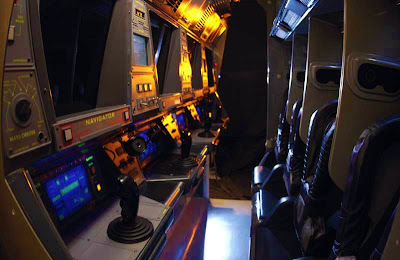 ], pilot, commander or engineer) and given two tasks to perform during the mission, simply by pressing a specific button near the magnified display in front of each rider (simulates a window to space with high-resolution computer-generated imagery) when prompted. The mission includes liftoff from the ISTC, a slingshot around the moon for a gravity-assisted boost, a brief period of simulated hypersleep (to pass the lengthy time required to reach Mars), and a descent for landing on the Martian surface. As a training exercise, the mission contains several unexpected situations that add to the drama. The attraction can leave you feeling disoriented, woozy and even, as some riders report, with a headache for the rest of the day. Even worse, in June 2005, a four year old boy passed out while on the ride and later died, and in April 2006, a 49 year old woman became ill on the ride and later died. Both persons apparently had unknown health problems. 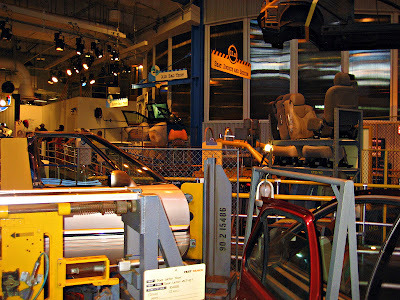 In both cases, the ride was found to be operating properly. There are 13 warning signs you encounter on the way, and you are given multiple chances to change your mind about riding, being asked repeatedly if you're sure you want to continue. Once boarded, fans gently blow air at riders to help avoid motion sickness, and a few months after the ride's opening, actual motion sickness bags were added within easy reach! The section of Future World called "The Land," is a 2.5 million square foot facility dedicated to human interaction with the land itself. It explores how humans can both use the land for their benefit, and how they can also destroy it. Future Technology in better preserving the land is also explored in the pavilion, along with a focus on the celebration of the land itself. Sturgeon Tank, What a Whopper! 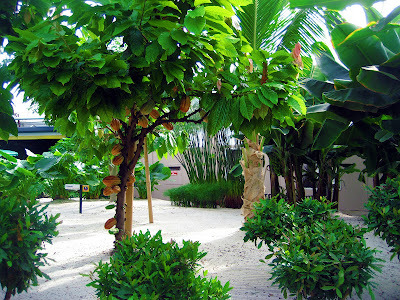 Tropics Greenhouse: Features crops from the tropical areas of the world, including both familiar and exotic foods, like banana, cacao, jackfruit, peach palm, dragonfruit, vanilla, cleome, pineapple, java apple and papaya. Over 30 Tons of Produce are Harvested from The Land Each Year! 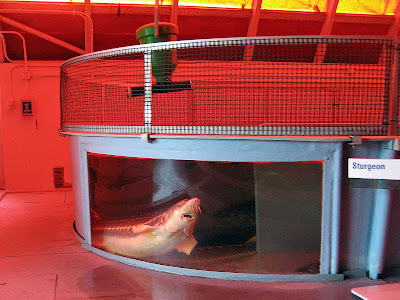 Aquacell: Focuses on aquaculture, aka "fish farming," and includes several tanks displaying Tilapia, Sturgeon, Catfish, Bass, Shrimp, American Alligators and American Eels. Some of the fish harvested here are served in the park's Coral Reef Restaurant. 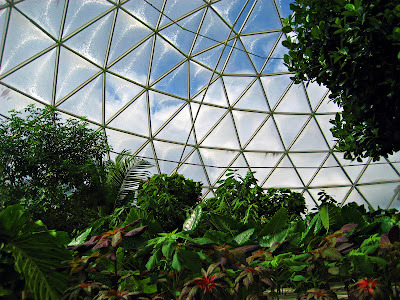 Temperate Greenhouse: Features the concepts and technologies of sustainable agriculture, including intercropping, integrated pest management and specialized irrigation systems that reduce waste and increase crop production. 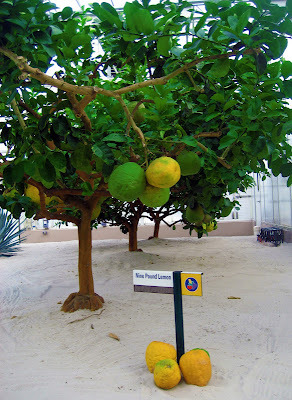 Currently, it showcases large-sized crops, such as Prizewinner and Atlantic Giant pumpkins, winter melon, pomelo, and "Nine-pound Lemon." Other crops include sunflower, beets, turnip, cotton, millet and cassabanana. 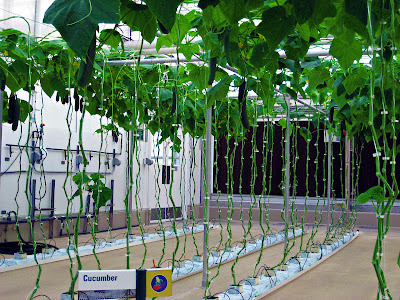 String Greenhouse: Focuses on innovative high-density techniques, such as nutrient film and vertical growing, in which plants are grown on specialized trellises which cause the herbaceous plants to approximate the shape and structure of trees. One of the most famous examples of these trees is The Land's "tomato tree", which produced over 32,000 tomatoes in a 16-month period, recognized by Guinness World Records as both the largest and most productive tomato plant in the world! Other crops include eggplant, peppers, lettuce; cucumbers and pumpkins are grown in the shape of Mickey Mouse through the use of special molds. Much of the produce is used in The Garden Grill and Sunshine and other restaurants in the park. Now THAT'S a Tomato Plant! 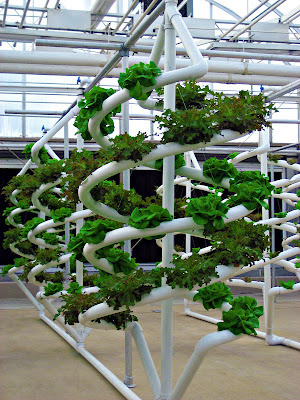 Creative Greenhouse: Shows some unusual ideas about the future of agriculture, mostly through Aeroponics, in which a fine mist of water and nutrients is sprayed directly onto the roots of the plants, dangling freely in the air without soil. 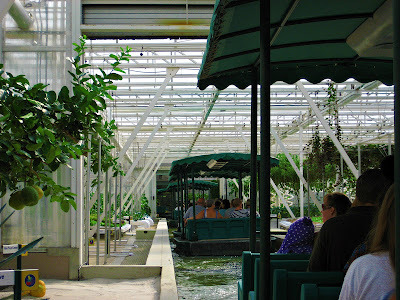 Some of the roots are enclosed within rotating columns and A-frame structures, while others are completely exposed to the open air, at least temporarily, so the entire plant may be viewed by the Guests on the boat ride. This area also features a small exhibit of NASA hydroponic growing units, which were developed for use on extended-length space journeys. Also, USDA scientists are currently working here to develop fruit with a longer shelf life. Crops on display include tomato, squash, lettuce, basil, rosemary, cabbage, super-dwarf wheat, swiss chard, marigold and snapdragon. 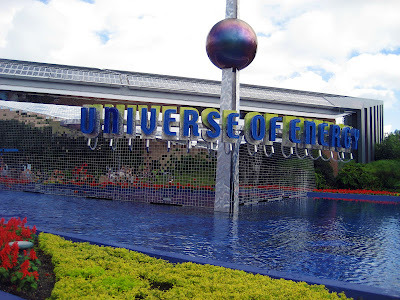 Before leaving Future World I hit up the Universe of Energy pavilion for the 45-minute Ellen's Energy Adventure attraction, to join Ellen DeGeneres in an 8-minute pre-show film in which she falls asleep and dreams of winning Jeopardy. Unfortunately her dream becomes a near-nightmare when she finds the returning champ is her former college rival Dr. Judy Peterson (played by Jamie Lee Curtis). All the categories deal with one thing she knows nothing about -- energy. Following the pre-show film, guests are seated in one of six seating areas, and a 6-minute film (on three, 70mm screens, 157 feet wide by 32 feet tall) is shown in which Ellen's neighbor (Bill Nye the Science Guy) guides Ellen on a "crash-course" in Energy 101, taking her back billions of years in time to witness the Big Bang and then into a prehistoric jungle where he explains the formation of fossil fuels. 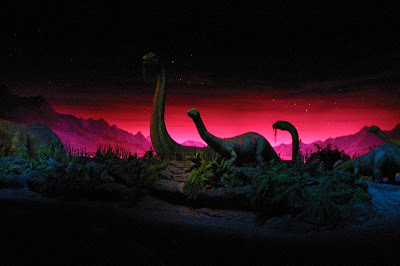 The moving theater then separates into six 97-passenger vehicles that travel through primeval dioramas, complete with prehistoric flora, fauna and a terrified Ellen. One of Whom Sneezes Water onto Guests! After the dioramas, you enter another theater and view a dramatic motion picture on three screens, each 30 feet tall and 74 feet wide and curved to create a 200-degree range of vision, where Ellen learns about the world’s present-day energy needs, resources and concerns. In particular it focuses on the origins of fossil fuels such as petroleum, coal and natural gas. It also mentions solar and hydroelectric power. FUN FACT: The ride is mostly powered by 2 acres of solar panels that sit on the roof. The equivalent power could supply enough energy to power 15 homes! 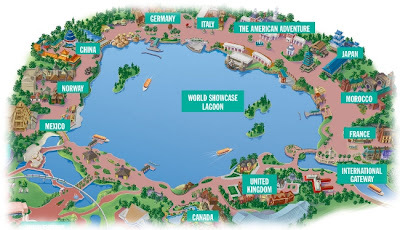 As you circle the lagoon, you'll transition from one country to the next. While each country is right next to the other, you'll never get the sense that you're in two places at once. 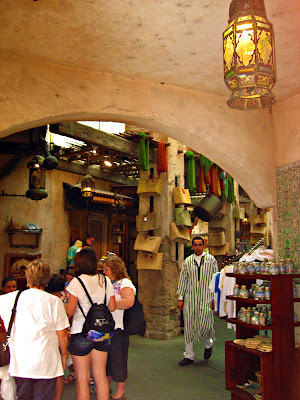 To enhance the experience, the vendors and other "Cast Members" (employees) are actually native to the country you're visiting and are always eager to talk about their homeland! 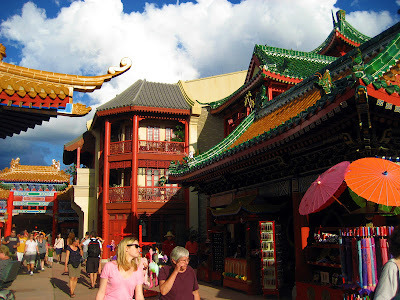 And unlike the other theme parks which sell almost identical merchandise, each country in the World Showcase has items that are only found there - from candy to clothing, CDs to Cuckoo clocks, the souvenirs are actually relevant to the particular country you're in. And my favorite part about the park - FOOD! While the portion sizes are small and the food rather stereotypical of the respective country, you get the chance to try different cuisines from all around the world! 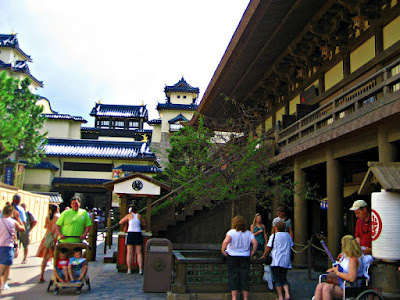 Even better, I had the added bonus of visiting during Epcot's International Food & Wine Festival, so in addition to the food from the standard 11 countries, there were COUNTLESS international food kiosks from OTHER miscellaneous countries as well, WOO-HOO! Making my way counterclockwise around the lagoon, I entered Canada (not too foreign from my home state of Minnesota, what can you do, "eh? "), stepping into a peaceful landscape with magnificent gardens, majestic architecture and a canyon reminiscent of the Canadian Rockies. A 30-foot rushing waterfall offers a refreshing spray and carved totem poles add to the ambiance. There's a 14-minute "O Canada!" film in CircleVision 360 that takes you on a visual journey across the the country, hosted by Canadian actor Martin Short. 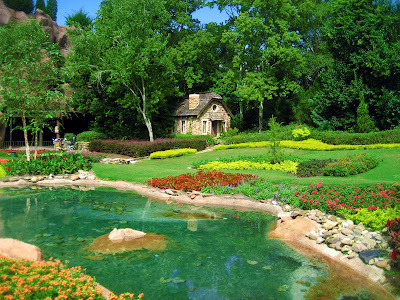 Le Cellier Steakhouse is a warm, wine-cellar atmosphere with table service. Entertainment options include Celtic style rock band, "Off Kilter," offering a unique mix of belly laughs and great music. As for shopping: The Northwest Mercantile features everything from Canadian folk art, pewter and other items. 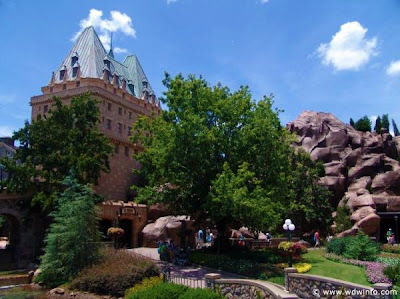 Interesting note: Prior to the construction of the pavilion, the Walt Disney Company sought funding for the cost of building the attraction from the Canadian government, in return the government would have input into the design and layout. The Canadian government was concerned about the stereotype of Canada that Disney wanted (i.e., lumberjacks, lol), so they refused, and Disney threatened to pull the exhibit, but ultimately did not. 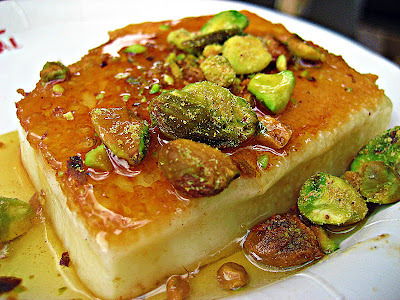 After a small plate of Griddled Greek Cheese with Pistachios and Honey from the IFWF's (International Food & Wine Festival) Greece kiosk ($3.25 and SO good! 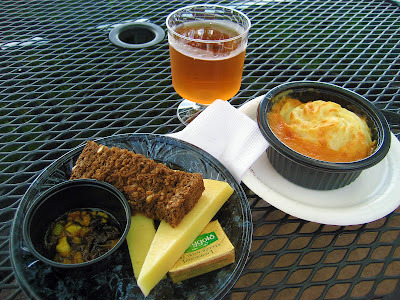 ), I stopped at the IFWF's Ireland kiosk where I ordered the Kerrygold Cheese Plate of Aged-Irish Cheddar, Dubliner, and Invernia cheeses with Apple Chutney and Brown Bread ($3.50 and delicious) Lobster & Scallop Fisherman's Pie ($5.75 and disappointing) and a glass of Bunratty Meade Honey Wine ($4.75 and nice). 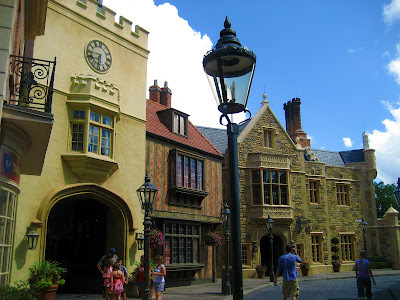 I moseyed around the neat shops and manicured gardens of United Kingdom, designed to look like old-world Great Britain, with cobblestone streets and architectural styles ranging from 1500 to 1800. 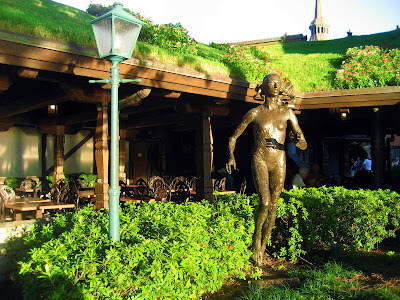 It has British gardens (including a hedge maze), shops selling items such as tea and Beatles merchandise, a comedy improv troupe, a band called " The British Revolution" that daily performs hits from acts such as the Police, The Rolling Stones, The Beatles, and Led Zeppelin, daily in the Pavilion. The Rose & Crown Pub and Dining Room mocks a quaint, classic British pub, and serves traditional British food and pints of ale, where I sat down and ordered a bowl of Winter Squash Bisque with Creme Fraiche and Pumpkin Seeds, served with butter and dinner rolls from my server Lindsay from England ($4.99 +tip and nothing special). There is also a quick-service counter serving Fish and Chips, and a sport shop selling British sport equipment, including Chelsea and Liverpool shirts. Leaving the United Kingdom, I strolled the Pont des Arts inspired footbridge over the English Channel into France. This pavilion reflects France from 1870-1910, a period known as La Belle Epoque, "the beautiful time;" the landscape reflects an urban ambiance and springtime in Paris, with a pool and fountains and view of the Eiffel Tower in the distance, and a spot reminiscent of the the Seine waterfront, complete with flower carts and street artists. 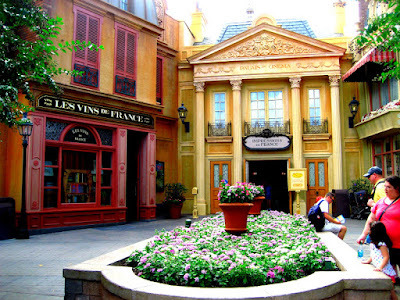 "Streets" are lined in cobblestones and romantic tunes are in the air. There's a pool and fountains and view of the Eiffel Tower in the distance. You'll find a book shop, art, a perfume shop selling Guerlain among others, theater, a sidewalk cafe (Bistro de Paris), restaurant (Les Chefs de France), a bakery (Boulangerie Patisserie) and several carts scattered around the busy garden marketplace of Paris, where you can shop for souvenirs, get a made to order crepe or visit the wine kiosk, which has fantastic Grey Goose vodka and Grand Marnier slushies. You'll often find Belle and her fur covered man greeting guests in the gardens, and throughout the day the "Serveur Amusant" acrobats perform, building a tower out of chairs and balancing on top! 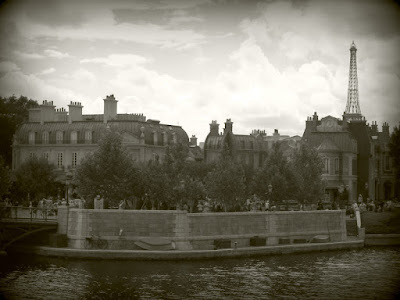 The park bordering the canal along the right side of the pavilion was inspired by the famous painting "A Sunday Afternoon on the Island of La Grande Jatte" by pointillist artist Georges Seurat. Also adding to the authenticity is the "Eiffel Tower." The much-photographed landmark is 1/10th the size of the actual tower and was built following the blueprints of Gustave Eiffel. In the Palais du Cinema I watched the 18-minute film "Impressions de France," a travelogue set to classical music, with scenes of Normandy, Loire Valley, Cognac, Cannes, Paris, and many more. An added bonus is that you actually get to sit down, a nice departure from the standing Circle Vision movies in China and Canada. After a trip to the IFWF's Belgium kiosk, where I ordered a Belgian Beer Flight of Hoegaarden, Leffe and Stella Artois ($8), Steamed Mussels with Roasted Garlic Cream and a Baguette ($3.75 and nothing spectacular), and a box of Guylian Belgian Chocolate Seashell Truffles ($1.75), I tried Escargots Persillade en Brioche aka Snails in Garlic and Parsley Brioche ($4.95 and yummy). A realistic Koutoubia Minaret (prayer tower) leads the way into the faraway land of belly dancers, intricate architecture and swirling mosaics that make up Morocco, the only pavilion in which the country's government aided in the design (the King of Morocco sent his royal craftsmen to lay all the tile work, carvings and paintings). Three cities are represented: Casablanca, Fez, and Marrakesh. The warm terra cotta tiles and carved plaster buildings topped with green roofs amidst the winding alleys and stuccoed archways add to the charm of the "jewel of North Africa." More of the exquisite craftsmanship is found in a replica of the Bab Boujouloud gate to the Medina (old city), where you will find the bustling bazaar of 6 shops selling everything from rugs to leather goods and traditional Moroccan clothing. The Ville Nouvelle (new city) has the Royal Gallery and the Moroccan National Tourist Office where you can see a three-screen slide show of the lifestyles and landscape of Morocco. The flower filled courtyard surrounded by citrus and olive trees, date palms and banana plants, includes a fountain inspired by the Nejjarine fountain Fez. In this area, you can hear Moroccan musicians, watch exotic belly dancers perform, marvel at the incredible acrobatics of the Houzali Troupe, or join the 45-minute educational walking tour "The Treasures of Morocco." 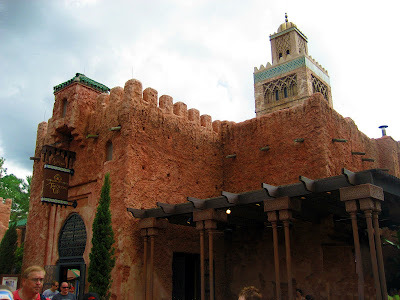 In the Gallery of Arts and History, you can enjoy the exhibits of Moroccan arts, artifacts and costumes. You can visit the Fez House, an example of a typical Moroccan dwelling. 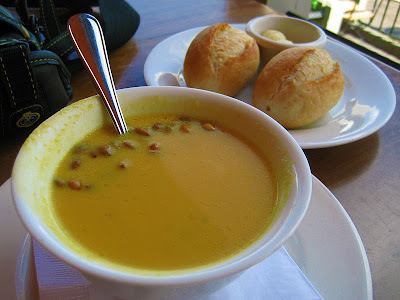 Restaurant Marrakesh, along with the Tangierine Cafe, serve Moroccan fare, including roast lamb in Tajine, Couscous, and Harira soup. Morocco and the United States have a very long relationship dating back to the 1700s. Morocco was the first country to recognize the United States as a separate nation. In the lobby of Restaurant Marrakesh there are letters from George Washington and the Moroccan King. Due to Islamic religious beliefs on the content of art, the mosaics contain no representations of people. 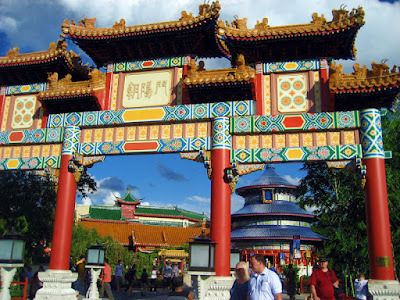 The US government sponsors the pavilion, while a corporation holds sponsoring rights on every other pavilion in the World Showcase. Japan takes you to a serene world of rock gardens, koi ponds and streams, and handsome blue-roofed buildings surrounding a courtyard that features the 5-tiered Goju-no-to pagoda, inspired by a shrine built at Nara in 700 A.D. At the end of the courtyard is the gate to a Japanese castle, which including a moat, that leads into a display of Japanese culture. Bamboo, Japanese maples, evergreen and monkey puzzle trees complete the landscape while the Taiko drummers provide an exciting atmosphere to shop or dine on sushi and tepanyaki. At the Bijutsu-kan gallery, I delighted in a fascinating little exhibit "Spirited Beasts: From Ancient Stories to Anime Stars," a depiction of Japanese mythology's creatures being adapted into pop culture, where I found myself mesmerized as I stared at a thousand perfectly-folded paper cranes (known as Senbazuru), believed to grant a wish. 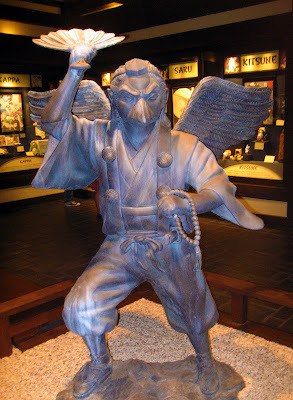 Mitsukoshi is an international Japanese department store chain headquartered in Tokyo, where I found authentic Japanese apparel, toys, Bonsai trees, Samurai swords and pop culture-related items. Had I known about the live demonstrations by Miyuki, a candy artist, I would have stayed. The art goes back over 250 years in Japan with artists creating animals or flowers from very hot, soft dough that hardens when it cools. 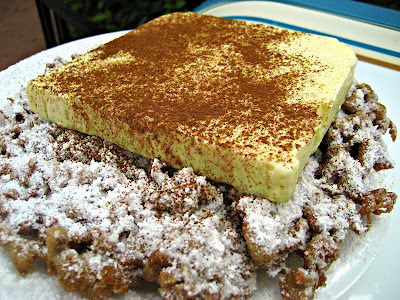 Pumpkin Spice Funnel Cake a la Mode! God Bless America! 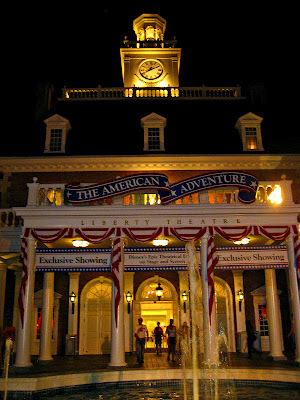 The American Adventure pavilion represents the United States with a single, classic Colonial-style mansion made of 110,000 handmade bricks of Georgian clay, inspired by Independence Hall, Boston's Old State House, Monticello, and Colonial Williamsburg. It contains the American Adventure show, the American Heritage Gallery, the Hall of Flags exhibit, a small gift shop, and a fast food restaurant (that's America, LOL!) 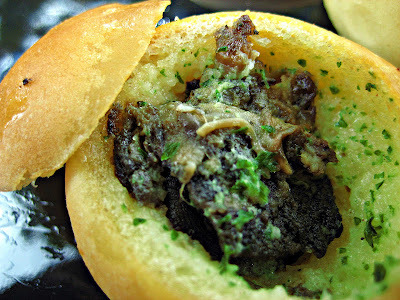 serving typical American fare such as cheeseburgers and hot dogs. After ordering [American-sized] Pumpkin Spice Funnel Cake a la Mode ($9.25, but SO good! ), I stood and watched The Spirit of America Fife and Drum Corps play marching music and in military formation, then stepped inside to listen to the The Voices of Liberty (a 10-member a cappella group performing popular patriotic choral pieces in full period costume) in the beautiful rotunda lined with numerous paintings and famous quotations from well-known Americans, with a floor made of marble and copper. The adjacent room houses the American Heritage Gallery's exhibit "National Treasures," which features over 40 special artifacts like Abe Lincoln's stovepipe hat and items representing the lives of Rosa Parks, Jackie Robinson, Astronaut Gus Grissom and so on. I left the main lobby and proceeded up the escalator through the Hall of Flags exhibit hanging above me, a collection of 44 flags that have flown over the United States in all its forms, including Revolutionary War flags, Colonial flags, and foreign flags that once had claim to the land. 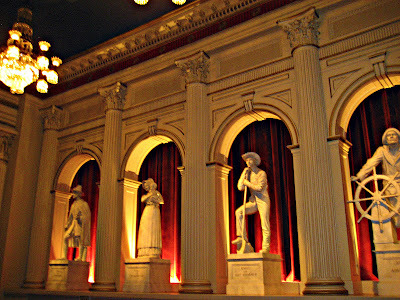 I followed everyone into the grand American Adventure Theater, distinguished by 12 life-sized "Spirits of America" statues, and took my seat for the inspiring 30-minute American Adventure show, which uses 35 lifelike Audio-Animatronic figures and filmed sequences in dramatic recreations of extraordinary people and events in American history. 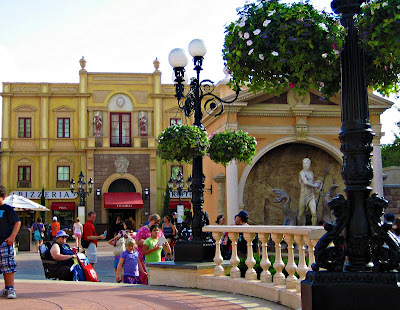 I continued to Italy, which features a plaza surrounded by a collection of buildings evocative of Venetian, Florentine, and Roman architecture. 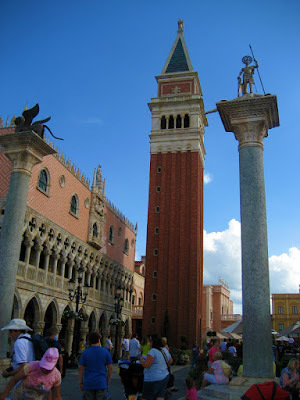 Venetian architecture is represented by a re-creation of St Mark's Campanile (bell tower) and a replica of the Doge's Palace. The pavilion's design is inspired by other hallmarks of Italian architecture, such as the Neptune Fountain (reminiscent of Rome's Trevi Fountain) and the Il Bel Cristallo shop (resembling the exterior of the Sistine Chapel). Musicians, clowns and jugglers often appear in the piazza throughout the day, and there are small shops selling fine Italian perfumes, chocolates, wine and espresso, Murano glassware, Florentine soaps, Venetian paper mache masks, Pulicati handbags, in which to browse. The romance of Venice fills the air with attention to detail in bridges and the gondolas moored to the barber-style striped poles alongside the lagoon. The landscaping will delight gardening buffs with the olive trees, Mediterranean citrus, kumquat trees, grapevines, cypress and pines located throughout. 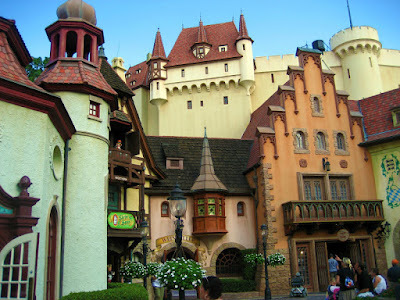 Germany reflects a diverse cross section of German eras and regions, from the replica of the medieval castle to the fairy tale Bavarian style buildings; fantasy, folklore and festivity abound. The cobble-stoned 16th century-themed Platz (square) is decorated with a clock tower that features a glockenspiel that chimes a special melody on the hour, and a fountain with a statue of St. George and the Dragon, which, according to legend, he slayed while on a pilgrimage to the Middle East. 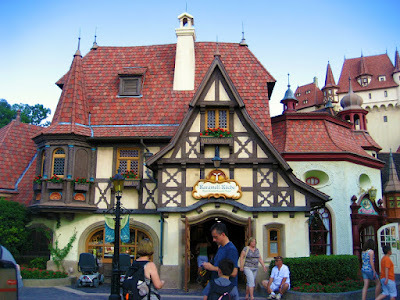 The pavilion has numerous small shops selling German goods, including dolls and cuckoo clocks. The area near the pavilion is decorated by an extensive model village with working model trains. Take a load off (and then gain two) at one of the long communal tables at the all-you-can-eat buffet, which contains an assorted sausages, breads, red cabbage, wine kraut, potatoes, sauerbraten, sauerkraut, spatzle, sausage and strudel, while treated to a live, traditional Bavarian show from Oktoberfest Musikanten, a spirited 6-member musical group dressed in full German costume including lederhosen! You'll see authentic German singing, dancing and yodeling, to traditional instruments like accordion, tuba and guitar. Oktoberfest filled the air as I stepped to the rear of the courtyard into the IFWF's Biergarten kiosk, where I enjoyed an $8 beer flight of Radeberger Pilsner ("founded in 1872, it is the first German brewery to brew beer in the traditional Pilsner manner. Well balanced, harmonious, and full-bodied with delightful freshness and a pleasingly herb note with brilliant honey-gold color"), Schöfferhofer Weizen ("one of Germany’s most well-known wheat beers, top-fermented, full-bodied with a distinctive, slightly sweet, floral aroma") and BraufactuM Roog ("creamy head, dark amber color, aroma of smoke, caramel and hops, medium carbonation, dry finish, odd combination," tasted to me like smoked bacon!). Triple Arched Ceremonial Gate into the "Land of Many Faces"
I stopped at the IFWF's South Africa kiosk for some "Bunny Chow" (a teeny, tiny portion of Vegetable Curry served in a Bread Loaf; $3.25 and not great), then just like that I was in China, entering through a large, triple arched ceremonial gate into a courtyard dominated by a replica of Beijing's Temple of Heaven, where, in The House of the Whispering Willows gallery exhibit, I found several ancient Chinese artifacts and an impressive scale model reproductions of a few of the more than 6,000 terra cotta warriors that comprised the "spirit army" that protected the tomb of the first emperor of the Qin dynasty. The original figures stood about 6 feet tall and were created around 225 B.C. No two were exactly alike, with distinctive details revealed in their armor, dress and personality, perhaps modeled after real soldiers. In the ornate Hall of Prayer for Good Harvest, I watched "Reflections of China," a 13-minute, standing-only, Circle-Vision 360° movie exploring China's rich history, culture and spectacular scenery, including footage of the Great Wall, the Forbidden City of Beijing, the Gobi Desert, Inner Mongolia, the Yangtze River and the tropical rain forests of Hainan Island. Outside, pavilion is decorated intricate carvings, serene gardens with footbridges, ponds, bamboo groves, and a small waterfall, offering a relatively peaceful respite from the crowds. The courtyard however (where you can watch Chinese acrobats perform ), is bustling with shops selling Chinese merchandise, and two Chinese restaurants. I ordered a Strawberry Oolong Tea Slushie ($4.96 and yummy) and Black Pepper Shrimp with Sichuan Noodles ($4.50 and barely edible). 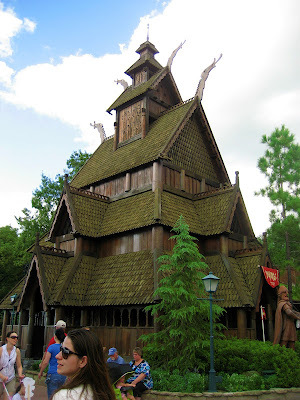 Next door sits Norway, a 58,000 square-foot pavilion designed to look like a picturesque Scandinavian village square, representing the Norwegian towns and cities of Bergen, Oslo, Alesund and Setesdahl, distinguished by a replica of a 14th century fortress found in Oslo, a stave church mimicking 13th Century medieval craftsmanship, stone and wood elements, and a cobblestone courtyard. 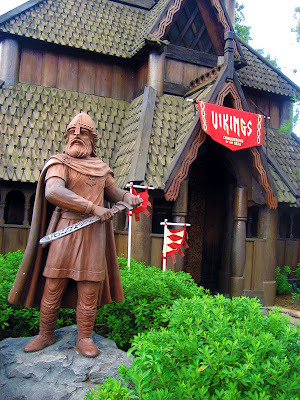 The area features the Maelstrom boat ride, Restaurant Akershus (hot and cold buffet and "Princess Storybook Dining"), Kringla Bakeri Og Kafe (Norwegian fare such as cream horns, lefse, and open-faced salmon sandwiches), an outdoor deli counter, a Viking Exhibit and interconnected shops decorated with large wooden trolls and selling assorted Norwegian goods, including clothing, candy, and statuettes of Norse gods and trolls. long distance runner and Olympic medalist Grete Waitz. Mexico resembles a Mesoamerican pyramid towering high in the sky, modeled after an actual Aztec Temple of Quetzalcoatl (the god of life); Quetzalcoatl represented by large serpent heads along the entrance stairs, surrounded by lush landscaping fashioned after a Yucatan jungle. I entered the pyramid through a gallery of artifacts from various periods of Mexican history, and the "Animales Fantásticos" Mexican art collection. I continued in the main room, the "Plaza de Los Amigos," to find a spacious darkened interior, creating an evening at a festive, musical marketplace with colorful carts and shops, a strolling mariachi band, and San Ángel Inn restaurant overlooking a lagoon with a smoking volcano and the grand Mayan pyramid in the background. To the side of the plaza, I boarding the "Gran Fiesta Tour Starring The Three Caballeros" boat cruise, a gentle boat ride through the pavilion that has Donald Duck disappearing to the Three Caballeros performance in Mexico City, with his friends going off in search of him, based on the 1944 Disney film "The Three Caballeros." 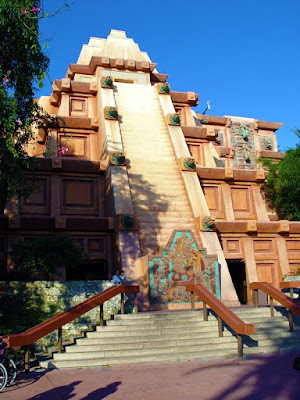 The attraction combines traditional animation superimposed over live-action film clips of stunning locales, accompanied by lively music, showcasing the history and culture of Mexico. Back outside, I ordered a Crispy Shrimp Taco with Chipotle Lime Mayo and Cabbage on a Flour Tortilla ($4.95 and tasty). I returned to Canada where I watched O Canada!, an 18-minute Circle-Vision 360° film of Canada's cities, natural beauty and people, hosted by Canadian actor Martin Short. It was dark outside when I the movie was over, so I took one last stroll, halfway around the World Showcase, a completely different look and feel at night. I spent wandered into a live concert performance by Billy Ocean, caught some traditional belly dancing at Restaurant Marrakesh, and snapped a few night shots before heading "home" for the day. Long day!